For a change, this blog has some amazingly good news to share. Latvian version of FDA a.k.a State Agency of Medicines in collaboration with Health Inspectorate has finally halted the distribution of infamous anti-cancer drug “Rigvir”. It turns out the vials of this rather expensive drug (around 360 Eur per 1 injection) do not actually contain what they are supposed to. How did this happen? “It’s like buying what you think is lemon juice, but finding that what you have is lemon-flavored water,” said Guntars Kaspars, ZVA’s deputy laboratory director. 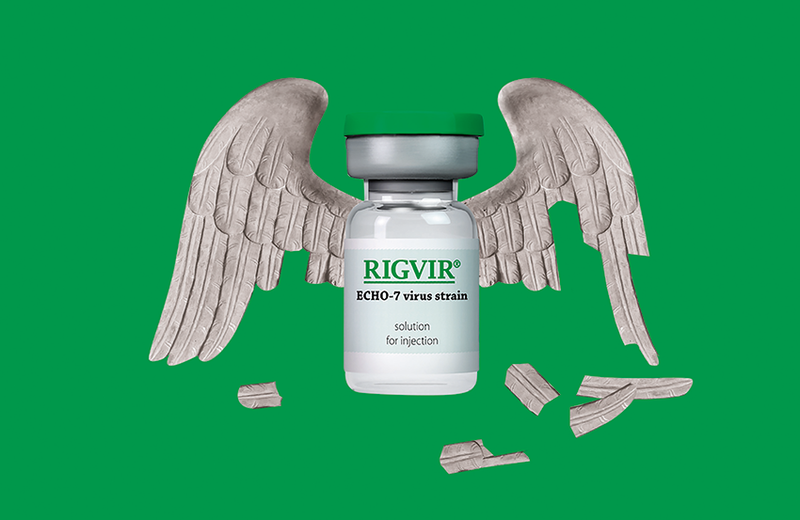 It appears that Rigvir owners tried to be sneaky and get ahead of the avalanche of the negative news and just recalled the product themselves, nervously squeaking an illogical mantra: “But patients were not endangered!” How on earth does insufficient amount of the active ingredient not endanger patients with cancer? It is not clear to anyone with any common sense. So, for a few days we waited for the final results of the remaining batches, and the news just came in. Insufficient amount of virus was found in all of them! As a result, State Agency of Medicines has halted the distribution of Rigvir in Latvia and also removed it from the list of state-reimbursed drugs. While this is indeed fantastic news for us, who have invested three years of effort into this story, and for any potential cancer patients who might want to use this miraculous “lemon water”, many questions remain unanswered. We hope to see an actual investigation by police and anti-graft office. There are not too many ways how this could have happened: either State Agency of Medicines and National Health Service employed ridiculously incompetent people who happened to really like Rigvir and be incompetent for approximately 15 years since 2004, or this is a prime example of blatant corruption. 1) Who were the political lobbyists in 2004 and 2009 that pushed for registration of Rigvir and then – renewal of licence? (Einars Repse, why are you so silent now?) Will anyone in the State Medicines Agency be brave (and human) enough and become whistle-blowers and tell the real story? 2) How long have there been problems with the vial contents and who knew about it? Since the very registration in 2004 or only since 2009 when State Agency of Medicines hid an expert report which claimed that not only there is no evidence the drug works, there’s more – the identity of the virus itself is not certain. If a smallish circle of skeptics suspected this several years ago, regulatory institutions would have surely known way earlier. Will state institutions take any responsibility for this situation? 3) How is it possible that the drug itself is manufactured in a GMP (Good Manufacturing Practice) certified lab Kevelt in Estonia, but the active ingredient, i.e., the legendary cancer-killing virus itself, has no GMP certificate? Why did Estonian lab not report any issues, even if they are “GMP certified”? Why was State Agency of Medicines OK with this situation? 4) Were any lab tests run on Rigvir vials before? How many, when? If not, why? How is it possible that the state certified LIC lab did not catch these problems before, if drugs have to be tested regularly to ensure quality? 5) How much money exchanged hands for all this to happen? And finally and most importantly – how can the relatives of patients who died after using Latvian “lemon-infused water” instead of an actual anti-cancer drug, get compensated for the loss of people they loved? Who will be responsible for the homes sold, pension plans exhausted, credit card bills racked up? How will Latvian institutions compensate the patients who are still alive for all the lost time, lost chances to participate in clinical trials with legitimate drugs, for all the false hope? Will anyone end up in prison over this fraud? Somebody from Rigvir, State Medicines Agency, National Health Service? Or perhaps the Ministry of Health itself? We will be waiting and watching. P.S. Have you used Rigvir? Please get in touch at rigvirfacts@gmail.com. We will gladly collect stories to share. If you are a lawyer, thinking of representing patients harmed by Rigvir and Latvian state institutions, we have documents and information to share.